My only hope is to fully submit myself to Christ’s Lordship and authority on the matter, and to do this, I must seek out those who exercise this authority. If they judge me to be free to remarry, I will accept their judgement. If they judge me not to have been free to enter into a new marriage relationship, I will accept their judgement on this too. I will never sever my marriage with Cathy–what? shall we sin all the more that grace may abound even more?–but I will live to the full the covenant of marriage with her that I should have lived with my first wife, and I will live a life of prayer and faith and trust in the Lord Jesus Christ. And I will go to every mass knowing that in this mass the body and blood of Christ is indeed being offered for my sin whether I commune or not. There is probably so much here that you would say is not “rightly dividing law and gospel”. But things are not always as black and white as “law” and “gospel”. I am a broken, sinful human being, who never the less is justified through faith in Christ in baptism, and I live by the mercy of God. I do not demand that he change his law for me. It is enough to know that Christ has died for me, and that I will sit at God’s table in eternity when I will be free from all brokenness, and all the grey stains of sin. If you have never read my Year of Grace blog, check it all out here. The battle is on in St Mary’s South Brisbane? Reflecting on the two previous posts, I want to add a final statement that most clearly clears up the confusion I was feeling in regard to Cardinal Kasper’s comments about Brother Roger. 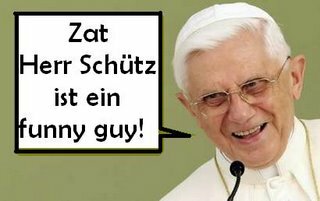 The difference between Roger Schütz and David Schütz with regard to communion with the Catholic Church (I am limiting myself here – the most obvious difference between Br Roger and myself is that he was a saint, and I am a long way from achieving that goal) is that he did not believe that he was called to enter into full formal communion with the Bishop of Rome. The main reason for this appears to have been that he believed formal unity with Rome would have worked against his personal vocation to promote Christian unity. I, on the other hand, did feel that God was calling me to enter formal communion with the Catholic Church. My own committment to ecumenism was (and is) no less than Brother Roger’s. In my own conscience, formal communion with the See of Peter is the only way in which I believe I can be true to that my vocation to promote Christian unity. Unfortunately, that means that at the same time I have had to embrace the pain of ruptured communion with the “the faith of my origins” – pain that goes to the very heart of my personal life with family and friends. It is my profound prayer and hope that within “the mystery of the Catholic faith” this communion will one day be fully restored. Some resolution on the Brother Roger question? 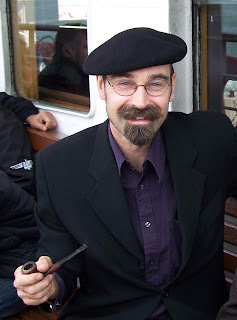 In the dicussion about Brother Roger’s ecclesial status in the post below, Dr Mike Liccione pointed to a comment by one of his commentators on his blog. For the record, Mike, I think your commentator has it exactly right. Question: Was Brother Roger in full Eucharistic Communion with the Catholic Church or not? Question: Was Brother Roger given Eucharistic Communion in the Catholic Church or not? Although it sounds contradictory, this is fully in keeping with the practice of the Church. Baptised Christians who have not been received into full Eucharistic Communion with the Catholic Church may be given communion under certain circumstances. While on the surface, paragraph 4 appears fairly restrictive, it has in fact been exercised pastorally with some latitude. I will give an example. My Lutheran wife and oldest daughter do not (as a rule) receive communion when the come with me to mass (my second daughter is doing her first communion at her Lutheran parish in a few weeks time). They respect me and my beliefs and they respect the Church’s beliefs. However, they do have a genuinely Catholic belief in the sacrament, and are very well disposed toward the Catholic Church. But at World Youth Day, after a week of immersion in the whole Catholic thing, and then to be at the Eucharist with the Holy Father while at the same time having no access that day to a Lutheran eucharist, they asked me if it would be permissable to receive communion. I pointed out the Church’s teaching on the matter, and then said that they should judge for themselves. They both communed. This was, however, a highly exceptional circumstance, and they have not used this one reception of communion as an excuse to begin receiving communion at other times when they come to mass with me. I imagine, however, that if I were to die tomorrow, they would all receive communion at my funeral mass. And this too would be according to the Church’s practice, which makes allowance for such pastoral situations. Roger had not received Catholic confirmation, so he cannot have been said to have been “admitted to” Eucharistic communion. However he was GIVEN Eucharistic communion. This must be taken as recognition that (as the canons say) he “manifested Catholic faith in these sacraments and was properly disposed”. And that is about the sum of what Cardinal Kasper says in his interview. Nothing more and nothing less. It was the repeated instances in which Br Roger was given communion which led to the impression that he had been “admitted to” full Eucharistic communion. 129. A sacrament is an act of Christ and of the Church through the Spirit. Its celebration in a concrete community is the sign of the reality of its unity in faith, worship and community life. As well as being signs, sacraments—most specially the Eucharist—are sources of the unity of the Christian community and of spiritual life, and are means for building them up. Thus Eucharistic communion is inseparably linked to full ecclesial communion and its visible expression. At the same time, the Catholic Church teaches that by baptism members of other Churches and ecclesial Communities are brought into a real, even if imperfect communion, with the Catholic Church and that “baptism, which constitutes the sacramental bond of unity existing among all who through it are reborn… is wholly directed toward the acquiring of fullness of life in Christ”. The Eucharist is, for the baptised, a spiritual food which enables them to overcome sin and to live the very life of Christ, to be incorporated more profoundly in Him and share more intensely in the whole economy of the Mystery of Christ. It is in the light of these two basic principles, which must always be taken into account together, that in general the Catholic Church permits access to its Eucharistic communion and to the sacraments of penance and anointing of the sick, only to those who share its oneness in faith, worship and ecclesial life. For the same reasons, it also recognises that in certain circumstances, by way of exception, and under certain conditions, access to these sacraments may be permitted, or even commended, for Christians of other Churches and ecclesial Communities. …Catholic ministers will judge individual cases and administer these sacraments only in accord with these established norms, where they exist. Otherwise they will judge according to the norms of this Directory. Don’t get me wrong. I truly believe Br Roger was a saint, and I also believe that he was, to all extents and purposes, a Catholic, even if not “formally” so. But no matter how sincere he was in his attachment to the Catholic faith, how come the canons did not apply to him, but apply to the rest of us? And a couple more questions: If Br Roger daily received communion at the Catholic liturgy in Taize, did he still receive communion from Protestant altars? (although, I understand that protestant eucharists are not celebrated at Taize). And did he continue, as an ordained Reformed minister, to celebrate the Eucharist himself? In case you have been living under a rock, in the last 48 hours a “perfect storm” has begun to brew in the United States over pro-abortion politicians who are publicly known to be practicing (if not actually “faithful”) Catholics. And, as with our “test case” here in Oz, the bishops are the ones caught in the centre (since responsibility for the administration of the eucharist in their dioceses ultimately falls upon them). Here are the links. Read them for yourself. More good news from Melbourne – Thanksgiving Program Increases! 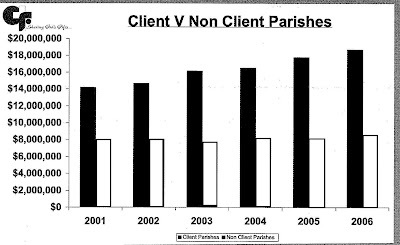 All of this information is based on actual receipts, as submitted by parishes in their Annual Returns to the Diocese from 2001-2006. I take all my hats off (and I own quite a few) to the team at Catholic Fundraising. They are doing a great job. And keeping me, at least, in full time employment (or, more to the point, with a full time salary). St Peter the Apostle Parish had not used the services of Catholic Fundraising since I 99 I. Fr Anthony Doran and the Parish Finance Commiftee decided it was time to do so again, It paid off! Income increased from $2,263 a week to $4,404 weekly with 47 new givers. Fr Doran summed it up “Overall, the feedback has been very positive from the parish and the results exceeded our expectations”. Fr Owen Doyle parish prest of St Marys Rushworth took on a professional renewal of the parish Thanksgiving Programme at a time when others of his age have long since retired. This youthful octogenarian has always done things differently — like becoming a late vocation to the priesthood when his wife and mother to his nine children died.Today Fr Doyle still celebrates four weekend Masses at Rushworth, Stanhope, Cornella and Murchison — a round trip of 120 kilometres. The result of the programme reflected the high esteem in which Fr Doyle is held by parishioners. Income increased from $339 weekly to $1,134 weekly, with 43 new contributors joining the programme. Comments Off on More good news from Melbourne – Thanksgiving Program Increases!